Becton, Dickinson and Company (BD) has secured 510(k) clearance from the US Food and Drug Administration (FDA) for its new immunological diagnostic system. BD FACSLyric flow cytometer system is an advanced in vitro diagnostic (IVD) system developed to be used with BD Multitest assays for immunological assessment of individuals and patients having or suspected of having immune deficiency. Part of the firm’s clinical flow cytometry solutions, the BD FACSLyric system was also secured CE mark approval to market in the European countries. BD FACSLyric flow cytometer system is said to aggregate a benchtop-sized instrument with software, reagents and services to offer clinicians and scientists with accurate, dependable and repeatable results. The system will also endorse BD Multitest 4-Color assays and the BD Multitest 6-Color TBNK assay, which determine the percentages and absolute counts of T, B and natural killer (NK) cells, and CD8 subsets of T cells. These metrics will be helpful in the immunological assessment of individuals and patients having or suspected of having immune deficiency. BD FACSLyric is provided in four configurations to accommodate the changing clinical needs of laboratories. It is marketed as an IVD instrument in the US, Europe and other countries. BD Biosciences president John Ledek said: "The FDA clearance of the BD FACSLyric system continues BD's drive to increase access to new innovations in clinical flow cytometry technology to more labs around the world. "BD recognizes that products for the clinical market require ease of use and standardization from instrument to instrument to ensure consistent results that ultimately inform patient care." In April this year, BD agreed to acquire US medical technology firm C. R. Bard for around $24bn. 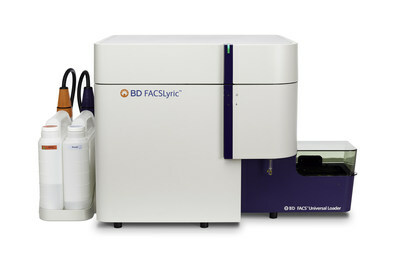 Image: The BD FACSLyric flow cytometer system. Photo: courtesy of Becton, Dickinson and Company.